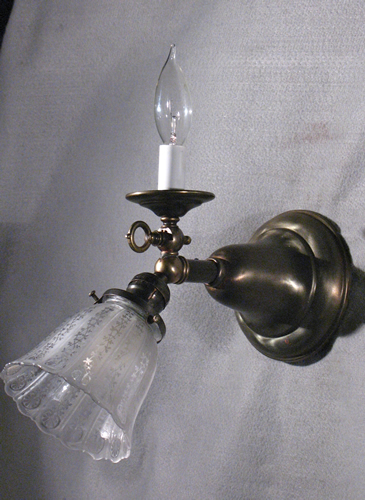 The Gas and Electric period started around 1885 after the invention of the electric light bulb. Previous to this period all light sources pointed up as they always involved a burning flame. With the light bulb came the task light where light pointed down and illuminated surfaces better. The Gas and electric form where one light source is pointing up and another pointing down really reminds one of the adage "Necessity is the mother of invention". The reason the gas and electric was combined on the same fixture was because the new technology, electricity, was not trusted. Thus you had the Gas and Electric form.